The trapezius muscles are located on the upper back and primarily move the shoulders, however the trigger points in this area can be closely linked with headaches and neck pain. There are multiple trigger points within the trapezius muscle. The first, Trapezius Trigger Point Number 1 - is located at the very tip of the shoulder and can found by pinching the tops of the shoulders. This trigger point the primary cause of temple headaches and can also send pain to the jaw and behind the eye. Trigger Point Number 1 is a frequent cause of dizziness, like that caused by the sternocleidomastoid. Trapezius Trigger Point Number 2 - is actually a pair of trigger points, within a very deep roll of the muscle. You can have either one, or both. 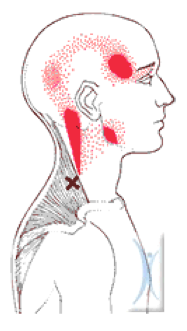 These trigger points are a major cause of pain in the base of the skull, which can feel like neck pain or a headache. Trapezius Trigger Point Number 3 - is located further down the back, near the shoulder blade. This trigger point is tricky, as it can often refer pain to the trapezius muscle further up, therefore causing a domino effect of headaches and pain cause in other regions of the trapezius. This trigger point can also lead to a burning sensation in the middle of the back that can come with sitting for long periods of time. Although this trigger point is further from the neck, it often is the cause of a stiff neck. When the muscle weakens due to prolonged trigger points within them, it can cause the shoulder blades to stick out and increase pain within the area. The symptoms caused by trapezius trigger points can be widely misunderstood and misdiagnosed. Common misdiagnosis of trigger points includes; Compression of spinal discs, bursitis and neuralgia among others. This is why trigger points should be at the top of any doctor’s list to check off when diagnosing. The trapezius muscle covers most of the upper half of the back, for this reason the uppermost part of the trapezius is what gives the back of the neck its shape. The trapezius holds the weight of the shoulders, neck and head and must be able to contract strongly and constantly for the mobility of the arms. Slumping in chairs, bad posture and habitually carrying your head forward can put unnecessary strain on these muscles, causing trigger points. Other causes of trapezius trigger points are; emotional tension that keeps yours shoulders raised. Also any physical jobs that require the arms to be extended for lengthened periods of time. Women with larger breasts can often suffer from trigger points in the trapezius as the muscles strain to support heavy breasts. Even something so little such as carrying a heavy handbag over your shoulder can cause stiff muscles and trigger points within the trapezius. Trigger Point Number 1 on the trapezius is located on the angle of the neck, right below the surface of the skin. Just by rolling the skin between your thumb and forefingers, you can feel the muscle. Doing this action very often reproduces temple headaches verifying the cause. If you have difficulty grasping the muscle, relaxing your hand and putting it into your pocket can make it easier to find. If your hand gets tired massaging this area, you can try rolling a ball against a wall with your muscle to relax it. Moving the ball around and in different directions, you will be able to feel when it runs over the muscle and give you some relief. Trapezius trigger points should be massaged up to 6 times a day for best results.